4.5Imagine a work colleague asking you what you were going to do for your summer holidays and you replied that you were off to Africa to shoot a few elephants, tigers and possible even a rhino. Ridiculous and appalling of course – but it wasn’t long ago that holiday snaps would feature ‘hunters’ standing proudly next to their kill.And not long ago that giraffes were shot purely because their tails made good fly swishes.I wouldn’t classify myself as particularly animal loving but to read about the hundreds of species that are hurtling towards extinction is truly shocking. Of course the public get behind campaigns to save the iconic (and usually large) creatures such as elephants and whales. But Girling argues that everything, from the tiniest shrew or insect, is equally as important.His book starts off with a mission to find out more about the Somali Golden Mole. This creature’s very existence is to be found purely down to a fragment of jawbone found in an owl pellet!Girling is a wonderful story teller, with a passionate belief in the importance of every living thing, however big or small. His voice remains steady until we reach the chapter on ivory, a chapter that made me want to weep. He apologises at the end – “I’m afraid that my voice in this chapter may have become somewhat shrill”. This book made a huge impact on me. I finish some books and instantly forget them as I move onto the next. But this one will stay with me. Picked this up at the library without ever having heard of it. 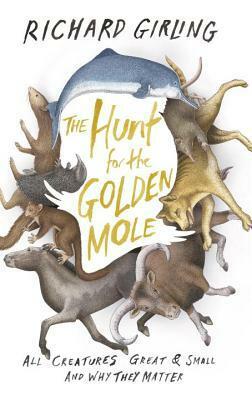 The novel concerns the author's search for the rare golden mole, which has never been observed, but parts of which had been previously found in an owl pellet. More than that however, the book concerns itself with the history of hunting, issues of biodiversity and humanity's challenging relationship with animals. I found the information interesting, and it did give me pause to think about the need to biodiversity in general. This book read very much like an extended magazine article, which makes sense because the author is a journalist. Like a lot of books hung on a 'hook' - in this case the author's 'search' for a species of mole only known from a couple of bits of bone in an owl pellet - there is a vague sense here that the thing isn't quite a cohesive whole, nor a collection of linked essays. There are some splendid gems, like the beeswax eating bird whose stomach enzymes break down tuberculosis, but sadly what will linger is the 'howl of despair' against a world in which species are being wiped out by mankind's seething stupidity. Girling’s description of his search for bones of the Somali golden mole, bones that were found only once in an owl pellet in 1964, makes for a powerful metaphor but his frequent, lengthy digressions about extinct and endangered species are far more interesting and compelling. A thoughtful and provocative elegy to living things. While this book makes some very good points, I was really hoping for something that focused more on living golden moles and other animals, rather than the history of killing animals for science. However, books that bring awareness to little-known animals such as golden moles are generally helpful in their conservation, so I would still recommend this. I really enjoyed the author's writing style, it felt like I was along for the ride down a rabbit hole. He provided a fascinating history of "collecting" specimens for research and taxonomy and managed to condense a pretty expansive way of thinking about endangered species (particularly mammals). Much more than just the search for an obscure species. The author covers natural history museum development, zoo and animal collecting history, conservation efforts/philosophy/examples, the desperate plight of elephants and rhinos, and a lot of his own personal experiences. There needs to be a sixth star option. Excellent on so many counts. Review to follow. Excellent book, though at times I got bogged down in details and had to reread pages at a time. But this is a great book about knowing our world and saving it. It's interesting in pockets, but not as a whole. And not very often. Free eBooks Countingthecost.org.uk Library is in no way intended to support illegal activity. We uses Search API to find the overview of books over the internet, but we don't host any files. All document files are the property of their respective owners, please respect the publisher and the author for their copyrighted creations. If you find documents that should not be here please report them. Read our DMCA Policies and Disclaimer for more details. Copyright ©2019 Free eBooks Countingthecost.org.uk Library - All rights reserved.